Beautiful $1000 uncancelled Gold Bond Certificate from the Memphis, Selma, and Brunswick Rail Road issued in 1882. This historic document was printed by American Bank Note Company and has an ornate border around it with a vignette of an old steam engine train, a ship, eagle, and workers in a field. This item has the signatures of the Company's President, Fred Wolffe and Secretary and is over 124 years old. The Memphis, Selma, and Brunswick Rail Road was originally incorporated as Memphis, Holly Springs & Selma RR, the name being changed in 1881. 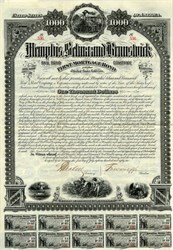 In 1887, the Memphis, Birmingham & Atlantic RR acquired the property of Memphis, Selma, and Brunswick Rail Road.